Vaquitas surface to breathe for only three seconds every couple of minutes. Lea este página en español. Mexico's Gulf of California — one of the most biodiverse places on the planet — teems with 891 species of fish and a third of the world's cetacean species, including the smallest and most endangered porpoise on Earth: the vaquita. Scientists say there are likely only 10 vaquitas left on Earth. Their extinction is virtually assured without bold, immediate action. Vaquitas are about the size of small humans, topping out at about 5 feet long and 120 pounds, with black borders around their expressive eyes and rounded mouth. They're known to be shy and elusive — but all too easy to scoop up in fishing nets. The vaquita's numbers have plummeted from 200 in 2012. Their primary threat is entanglement in fishing gear, including in nets set for the totoaba, a large and endangered fish endemic to the Gulf. Totoaba swim bladders are illegally exported to Asia to make soup perceived to have medicinal properties. Demand for the bladders spiked around 2011. A single bladder can reportedly sell for between $2,500 and $10,000. The demand means even more vaquita-entangling nets in the water. In response to international pressure, in 2015 Mexico announced a new two-year ban on gillnets in the Gulf to protect the vaquita. But the remoteness of the Gulf — ringed by high cliffs and dotted with hundreds of desolate islands — has made it challenging to police, particularly given the involvement of drug cartels in the illegal totoaba trade. And Mexico has a sad history of announcing plans to save the vaquita, but failing to follow through with enforcement. For years, the Center and our partners have been working to create more tools, resources and incentives to save the last vaquitas. In 2014 we petitioned the United States, under a U.S. law called the Pelly Amendment, for trade sanctions against Mexico over illegal fishing. This could include a ban on shrimp imports from Mexico — if the country doesn't crack down on the criminal totoaba trade threatening vaquitas. After no response to our petition, we filed a notice of intent to sue the United States in 2017 to force those trade sanctions. We've also petitioned the United Nations Educational, Scientific, and Cultural Organization (UNESCO) to place the Gulf of California on its World Heritage “in danger” list. This would give Mexico more funding for vaquita protection, along with international assistance for this rarest of porpoises. In 2017 the UNESCO World Heritage Committee gave Mexico one year to improve protections for vaquitas' home or face an “in danger” designation for the Gulf of California site. In May 2017, with the vaquita population having declined by 90 percent over the last five years, the Center and allies petitioned the U.S. National Marine Fisheries Service to ban imports of seafood caught with gillnets in Mexico's Upper Gulf of California. Still, vaquitas have continued to decline at an alarming rate. The pressure is on both the United States and Mexico to save this tiny cetacean from disappearing forever. Please act now. 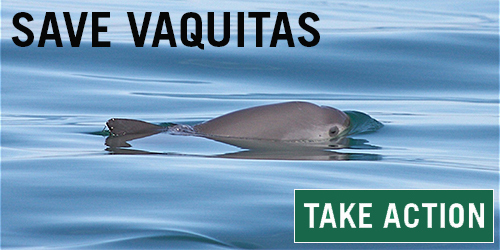 Help stop vaquitas' extinction. 2015 petition to include the islands and protected areas of the Gulf as "in danger"